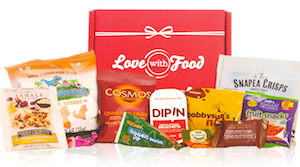 Home > Community > Contests & Winners > Doing Good > Say Hello To Love With Food’s Millionth Meal Donator! 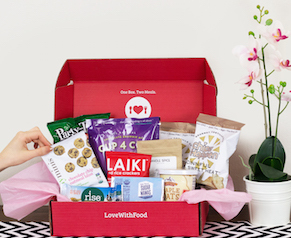 Say Hello To Love With Food’s Millionth Meal Donator! Last month everyone at Love With Food was so excited and proud to reach a HUGE milestone: donating one million meals to food banks around the U.S. And while we were all so grateful to every single person who helped us get there, that last meal that put us over the top was all thanks to the incredibly generous (and adorable) Kim Gorman! Here’s Kim showing some Popchip love. Kim has been a loyal subscriber to Love With Food for just over a whopping FOUR years, which means she’s stuck with us through thick and thin. We wanted to call her out for being such a fantastic Love With Food-ie, so we chatted with her recently about her thoughts on being part of Love With Food. KG: “This is a “Chicken or Egg” question… I know that Little Red Dot Kitchen’s Bak Kwa is involved, but I cannot remember if you led me to them or they led me to you. Either way, I’m so glad! I love food, and I particularly enjoy browsing new and interesting food items. I’m not really a “snacker” though, so I found that I’d purchase things just to try, and most of the time they’d go to waste because once my curiosity was satisfied, I was moving on to the next thing. Enter Love with Food. My dilemma was solved! Small portions of unique and healthy snacks delivered to me once a month like a gift?? Where do I sign? KG: I’d love to say that the social mission is the first reason why I subscribed, but first and foremost, it was the promise of deliciousness. However, I love the fact that something I would have bought anyway is helping feed hungry kids. To have hit the Million Meal mark in such a short period is such a testament to what a great company Love With Food is. I’m glad to be a part of it. KG: If you love food and enjoy healthy unique snacks this is a great way to give yourself a monthly treat while helping out those small producers who are leading the change in the food industry. Plus it’s fun! KG: Oh my gosh, there are so many! I’d have to say Pretzo Chang-o Squares by Jer’s Chocolate. I’m not normally a “sweets” person, but these are sooo good! Other favorites are Bak Kwa from Little Red Dot Kitchen, Lord Nut Levington’s Bloody Mary Peanuts and Dancing Deer Rosemary and Pink Sea Salt cookies. KG: I think the founder Aihui’s story is really inspiring and I am excited to support a company that is local to me. I appreciate the way the company is evolving including recently LOWERING prices. I mean, who does that?!? I expect to be a Love With Food subscriber for a very long time. Thanks so much again to Kim and all of our foodie adventurers who have supported us in this incredible journey! We love you all, and we can’t wait to hit two million meals with all of you! Want to get in on your own foodie adventure? Sign up today! Already getting a box? Tell a friend!